City Council unanimously approved Ken Genser Square as the name for the 1-acre site in front of City Hall (formerly known as Town Square). Former Mayor Ken Genser was a dedicated community member who served on City Council for 21 years, including 3 terms as Mayor. It's been years since the original front entrance of City Hall could be fully seen. This morning the old awning was removed, revealing the beautiful entryway facade to our historic City Hall. A temporary chainlink fence and traffic barriers along Main Street have been installed, signalling that construction of the 1-acre site directly in front of Santa Monica City Hall has officially begun. Chez Jay is and will remain open during park construction. The parking lot next to Chez Jay is currently closed for construction. We anticipate that it will reopen for use at the end of September. In the meantime, valet parking is available for Chez Jay customers. Work is progressing on schedule. We can now see formwork for most of the retaining walls and bays. And, of course, the surveying work never stops. We're reviewing mocked-up versions of the custom concrete surface materials that will be used for hardscape, seatwalls, stairs, walls, and runnels. We're also checking out rubberized play surfaces and wood railings before giving the go-ahead for fabrication. Over-excavation needed to support Observation Hill is progressing on schedule. A groundbreaking celebration on February 16 marked the official beginning of work on The Village at Santa Monica, a project that has been several years in the making. The $350-million residential and retail development on Ocean Avenue will contain 318 units, including 158 condos and 160 affordable apartments. It will also have commercial space on much of the ground level for restaurants and shops. Be excited... Be prepared. Here is your opportunity to ask staff about current and upcoming construction projects in the city. The Recreation & Parks Commission formed park name recommendations for City Council consideration. The Recreation and Parks Commission will pick up its discussion of name recommendations for Palisades Garden walk on January 19. The Commission will also weigh in on a name for Town Square. Landmark Commission will form recommendations in February. The decision will ultimately be made by City Council in March. With City Council's approval of the final design elements, James Corner Field Operations and their team of experts will now work on completing the Construction Documents. Park construction will begin in Spring 2012 and is expected to be completed by the end of 2013. City Council will consider a revised design and appeal for Town Square and revised design for overlooks and streetscapes at its October 25 meeting. The Landmarks Commission will review a revised design for Town Square at a special meeting on Tuesday, September 20. 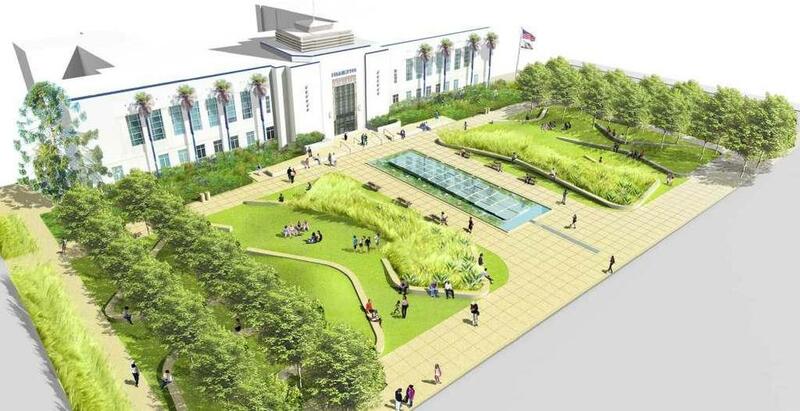 The modified design includes the retention, rehabilitation and/or relocation of certain existing historic character defining elements of the site, in addition to reconfiguring the site topography and grade, the installation of new landscaping and hardscape materials, a central water feature, new benches and seat walls, and lighting. Pursuant to Santa Monica Municipal Code, a Certificate of Appropriateness is required for any proposed alterations in whole or in part, of or to a Landmark or Landmark Parcel. Regulatory and advisory board reviews continue in July, including the California Coastal Commission, Santa Monica Architectural Review Board, and Santa Monica Recreation & Parks Commission. Site preparation work for the future park has begun, so we have added a "Construction Updates" section to this website. Stop by to read updates and see photographs of the site as it transforms from a parking lot to a spectacular public park. What does it take to make a park in Santa Monica? Frances Anderton finds out in "A Field Operation in Santa Monica" - a recent project profile on KCRW's DnA. City Council will review design development plans on Tuesday, June 14 meeting (Agenda Item 8A). Revised park designs, based on input from the 2/26 Community Workshop and various regulatory and non-regulatory commissions, will be shown.